Oktoberfest has an average attendance of 6.3 million people per year. This comprehensive tourist guide will inform you about everything you need to know about Oktoberfest. Each section in this guide will focus on a different aspect of the world’s largest folk festival – directions, security, prices, accommodation. This first part of the Oktoberfest travel guide will help you better understand the festival and what Oktoberfest is all about. It will also help you better plan your trip to Munich and the event. Lowenbrau barrel display at Oktoberfest. As I mentioned earlier, millions of people visit Oktoberfest every year. Why? Because people love getting together, listening to music, drinking alcohol – in this case beer – and socializing. But there are ways to make sure you have a great experience at Oktoberfest, while avoiding the overcrowdings, issues with security, and much more. Oktoberfest usually starts mid-September and ends the first Sunday in October. One might ask how did a festival that runs mostly in the month of September, got its name “Oktoberfest”? Prince Ludwig and Princess Therese of Bavaria were married on October 12th, 1810. Naturally, they had a big celebration for their marriage. And, just outside the palace on some large green fields, the townspeople took part of the celebration to rejoice for the Prince and Princess. Because they enjoy the celebration so much, it ended up turning into celebration every year. Now, it’s an almost month long tradition that attracts people from all over the planet. The green fields also got the name Theresienwiese as an honor to the Princess.So, the first festival did take part in October and the Oktoberfest location continues to be held at the Theresienwiese fields. The beer festival always runs for three weeks, concluding the first Sunday in October. If the end date of the festival falls before the Germany Reunification date (October 3rd), the event is extended until the following Sunday to incorporate German Unity Day. When is the best time to visit Oktoberfest? The best time to visit Oktoberfest in Munich is during the first week of the festival. In 2019, Oktoberfest is set to run from September 21st – October 6th. You can check out the full calendar dates running up to 2029 to plan a visit here. This is the best surprise about the festival. Oktoberfest is FREE! It is open to all curious visitors that want to enter its grounds and enjoy the festive atmosphere. Even entering the popular tents (which are nothing like tents by the way) is free. The opening hours of the festivals are from 9am untill 11pm. The execption is the opening day, when the mayor starts the celebration at 12pm. People can begin drinking anytime from 9am, except for the first day at noon, up until 11pm (23:00 in European). The last call for beer is at 10:30pm (or 22:30 in European). Beers comes in one-size serve all – 1-liter mugs. The average price of a one-liter beer is around 9.50 euros. Some are more expensive than others – check the menu before ordering. You must seat to be able to drink! They will not serve you if you are standing. There is no drinking outside of the tents. Food and concession stands do not sell alcohol. At Oktoberfest there are six large tents, known as halls, and eight smaller ones – a total of 14 tents. In the tents, you can only choose beer from six local Munich breweries: Augustiner-Bräu, Hacker-Pschorr-Bräu, Löwenbräu, Paulaner-Bräu, Spatenbräu, and Staatliches Hofbräu-München. The alcoholic content of the beers is around 6%. I personally enjoyed the Löwenbräu – what can I say, I love light, pilsner beer. Even though there are 14 tents, and I don’t think there is a best tent at Oktoberfest. They all have great food, live music, and amazing beers. Guests can’t smoke inside the halls or bring pets. Wine and Other Alcohol at Oktoberfest? Even though it is a beer festival, wine and other acohol is served at Oktoberfest. The Weinzelttent is didcated to wine and you can find a large number of varieties. If you want other types of alcohol like vodka, then check out theSchützen Tent. Lastly, most tents had mini-bottles of other alcohols for sale, inluding schnapps. What Oktoberfest tents are like by 4PM. If you are going as a group, then make sure you reserve a table. But, don’t worry if you are solo traveling or going as a couple, there are still ways to get a table. Reservations for tables in the tents at Oktoberfest require a minimum of 8-10 people. Anyone arriving after 12 PM on weekdays or during the weekends should considerbooking a table onlinebecause finding a spot will be next to impossible. There are some things to know before getting a reservation. First, locals in Munich call dibs on tables and get them before others. Second, just because you get a reservation doesn’t mean you will get what you asked for. Third, when your reservation time expires, you do have to leave the table. If you can find an empty spot in a non-reserved area, you can continue drinking in that tent. Fourth, with a table reservation, you can get food vouchers which will help you avoid the food crowds at night when everyone is hungry and ordering dinner. You can always get food from the street vendors. When I went to Oktoberfest, we were a group of three. We were able to get an empty table in the LÖWENBRÄU-FESTZELT tent at 10AM on a weekday. By noon it was already packed, and we were already sharing it with some visitors from Montreal – very nice people. We decided to explore Munich and left Oktoberfest. When we returned to the festival grounds around 4PM, the tents were full. If you plan to party at night, then make sure you have reservations. Just keep in mind that online reservations come with certain charges. Last travel tip for reserving a table at Oktoberfest, make sure there is always someone from your group at the table. You will lose it in a second! So, if you guys are smokers go in intervals and never all at once. Due to its popularity, Oktoberfest attracts LOTS OF PEOPLE, so yes there is a boost in the security compared to previous years. There are several entry points to the compound of Oktoberfest. At each entry point, there are guards that check people, their items, and bags. Avoid Backpacks. Even though it’s okay to bring them on the festival compound, it’s not possible to bring them in the halls (tents). You can only bring a hip bag or a purse. Make sure to read these rules before going there in order to avoid trouble with the authorities. Someone may find this funny, but we all have bathroom emergencies from time to time, right? Well, even though this is a festival with millions of visitors, finding toilets was not an issue. Each tent has several bathrooms to accommodate thousands of guests. And, if you find yourself outside on the festival grounds there are numerous bathroom stations – let’s call them like that because they weren’t porta potty, but they weren’t regular bathrooms either. There are employees that take care of the hygiene and were generally clean. It is a good behavior to leave them a tip. Many people decide to visit Oktoberfest even though they are on a budget. Good news for the budget travelers is that you can visit the festival without spending a fortune. I’d say that the biggest hazard to your budget is the tents. The prices for beer and food inside are a bit higher than the regular prices outside. Plus, there are lots of servers that just pass and offer various candies, drinks or souvenirs at a higher price than on the tent’s menu. The jolly atmosphere inside in combination with the alcohol could easily make you forget money issues and start spending like crazy. I mean, I bought a 12-euro schnapps and I don’t even drink strong alcoholic beverages. Other than that, the offer outside the tents is reasonable; the souvenirs aren’t too expensive (in comparison to other souvenir shops in Munich at least). 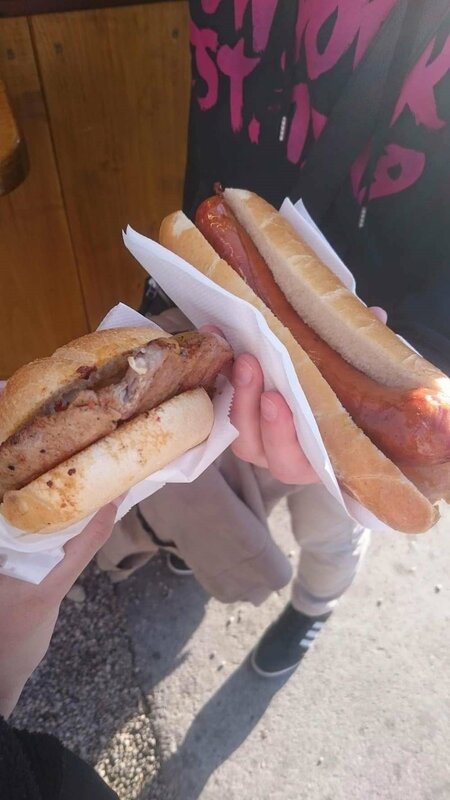 You can get tastyGerman wurstsfor a few euros as well as drinks and various desserts. Even though we did have a beer in one of the tents and stayed a while, we decided to buy food outside and save some cash. People always talk about Oktoberfest like a major getting-drunk party that I’ve never thought about all the other options. I was reluctant to visit it in the first place, since I don’t enjoy crowded spots and too much alcohol. However, Oktoberfest is much more than that. First, it’s a festival with an amusement park.There are lots of different rides; you can spin like crazy in teacups or experience a free fall from God-knows how many meters above the ground or go on a Scary House ride. There are options – lots of them – for both adults and children. Additionally, you can just wander around the tens of charming streets, take photos, eat wursts and enjoy the atmosphere. You can meet people, make friends, share experiences etc. Plus, you can enter the Bavaria Statue (for a fee) and have a magnificent view of the festival and Munich. Naturally, the tents shouldn’t be ignored either. When you enter a tent, you enter a whole new world of German culture, cuisine, and tradition. It’s wonderfully positive inside, with people smiling, eating and enjoying life. It just makes you happy that you are alive and honored to experience such an event. Most of the fun happens in the halls, with the sounds of the live music and the taste of local beer. As we all know by now, visitors often get a table in the morning and then stay there until the festival closes for the day. Since I’ve already introduced you to the festival and provided some pros and cons,I’d like to give you some essential tips for Oktoberfest. Naturally, not all the tips will apply for everyone, but I really hope this will bea useful guide for the first-time visitors of Oktoberfest and to planning your trip. Unless you’re staying somewhere near the festival grounds,you will probably have to plan your trip to Oktoberfest beforehand. In my case, we were staying at theKellermann’s Apartments in Memmingen. You might be wondering why would we stay in a different town and outside of Munich. Simple, accommodation is limited in Munich and prices are over the top. Munich is very expensive when it comes to hotels and rooms during Oktoberfest.I recommend that you book your hotel rooms even as early as February or March. For example, we planned our trip to Munich around June and July, and most hotels were either sold out or within a price range of $900-1000 for 3-nights. If you are rich or can simply just afford it, that’s great. But that’s not the case for most. So, we ended up looking for smaller towns around Munich. Don’t over look accommodation in smaller places, especially in Germany where they have one of the best public transportation systems. Getting around Munich or to Munich for other towns is no easy task. As I said before, we decided to stay in Memmingen. So, our next obstacle was, how do we get to Oktoberfest from Memmingen? We had a lot to figure out before getting to the festival. For example, where to park our rental car, where to find the appropriate public transportation to get into Munich and which transport applied to us from Memmingen (U/S-Bahn), how much and which ticket to purchase, how much parking was, etc. Memmingen is about an hour east of Munich. So, we researched some Park and Ride locations very close to Munich, but outside of the city to avoid high parking rates. We ended up going to theKlinikum Großhadern Park and Ride.Theparking fee was 1 euro for the entire day(automated machines), and it is an open parking lot. The U-Bahn is right next to the parking lot, and the trains go every 5 minutes, getting you into Munich in less than 10-15 minutes. We bought a group daily ticket (12 euros) for the U-Bahn(three travelers) and ended up spending a lot less money than expected between all of us. Also, keep in mind that around Munich a ticket for U-Bahn is valid for the bus and S-Bahn. If you end up getting a group ticket, stay together so you don’t get fined. Do some research and see what public transportation you can use to save time and money. Driving into Munich is really expensive, and hectic because of limited parking space – try to avoid driving in Munich at all costs. After all, Oktoberfest is a festival fair and it’s not that common to use a credit/debit card at fairs. We did use a credit card once and several places accepted them; however, most of the stands and tents are cash only. Therefore, it’shighly recommended to bring enough cashinstead of risking running out of money in the middle of the day. Just like any other event of this scale,Oktoberfest has busy hours and not so busy hours. It’s smart to know when to expect a bit more relaxed atmosphere and when to expect massive crowds. Early in the mornings up until noon during business days it’s the least crowded,since Germans are at work and those that partied late at night are asleep. During this period, you’ll mostly find curious visitors and families. Everything seems to changeafter 12 PM on business days and anytime during the weekends. This is when the masses hit Oktoberfest, the tents, and the streets. If you wonder when the best time is to visit, then I’ll say that depends on your personal preferences – if you are a party goer or not. Putting on your favorite shirt and sandals is a great option literally anywhere else – not at Oktoberfest! Visitors at the festival tend to get drunk and puke, also beer spills around and clothes are ruined by the end of any festival day. Moreover, due to the crowds, you’ll be stepped on, and depending on the weather it may even be raining. Therefore, it’s a clever idea to dress in several layers and be equipped with boots or at least sneakers. Don’t hesitate tocheck out the weather forecastand possibly bring an umbrella or something waterproof if it’s expected to rain. The first time we went, it was extremely cold during the first part of the day, and then suddenly the sun came out in the mid-afternoon it was reasonably hot. Luckily, I had a long-sleeved shirt under the sweater and when I took off the sweater it was perfect. My friend, on the other hand, had a tank top under the sweater and she couldn’t take it off; so, she spent the day either freezing or sweating. Smoking is allowed only at special smoking areas. It is not advised to bring a backpack or a large handbag, while almost anyone is eligible for a random identity check by the numerous guards. These are only some of the rules that visitors should have in mind and I recommend anyone going to Oktoberfest to read the applicable rules for that season in order to avoid issues with the authorities. Leaving a tip to the waiters is a huge thing at Oktoberfestand it’s smart to respect this, especially if you plan to sit at the same table for hours. It’s always the best to have the waiter like you and provide you with impeccable service instead of avoiding you and thus making it impossible to place an order. While the tips mentioned before are the most important ones, at least in my personal opinion, there are some other things to have in mind. Ladies are advised not to wear a purseand possibly store their belonging into pockets or safe bras. Another thing to remember isnot to leave the tent and the tablebefore consulting with the security first; this may result with you losing your table and not being able to enter the tent again, especially during busy hours. “Sharing is caring”could be a motto for Oktoberfest since people share the tables due to limited space; thus, don’t even try to oppose this idea or you may be criticised and frown upon. You may also want to learn some songs beforehand, so you can sing along and learn some German phrases in order to fit in. Finally, have in mind thatordering a beer is possible only if you sit down at a table. This is my favorite part of this guide. I want to share and write about all the wonderful things you can expect at Oktoberfest. Those that still haven’tread what Oktoberfest is and what to expect at the festival, you are advised to read that text first. All my life I’ve been hearing about the beer festival called Oktoberfest in Germany. I’m a beer girl so that seemed attractive to me, but when I first set foot at the Oktoberfest’s grounds, I discovered that it’s much more than just a beer festival. I would describe it as a fair on steroids or a three-week party with millions of visitors. Yes, there is lots of beer at Oktoberfest and it’s impossible not to get drunk since the only beer mug available is a 1-liter one. Nevertheless, this festival is about having an enjoyable time, eating delicious German and especially Bavarian dish specialties, enjoying Bavarian music, and much more. Moreover, there are probably a hundred different fair rides, so pretty much everyone can find something to suit their taste. I tried one of the Scary House rides, but there were many other extreme options too like free falls, round-ups and so on. As stated, several times before, this is probably one of the most popular and best-known events in the world. Therefore, you can expect to see over 7 million visitors at Oktoberfest looking for a wonderful time. Thus, this is a place where you can meet all kinds of different people; some friendly, some drunk…all in a great mood and ready to party. This event is a great spot for social butterflies that aren’t afraid of sharing a table with strangers, making friendships and partying all night long. Even thoughmost of the visitors will be wearing thetraditional Bavarian outfit– Dirndl (Oktoberfest outfit for the ladies) and Lederhosen (Oktoberfest outfit for the gentlemen) – there is no actual dress code to force you do wear one of those. Where can you buy a dirndl or Lederhosen for Oktoberfest? You have two options: get one before your trip to Germany or in Munich. or any other shopping service. Expect the prices to range from $60-$150 – and be careful not to get a Halloween costume. But if you want to go “more authentic” you can get an Oktoberfest costume anywhere in Munich. And, I mean anywhere! From the moment you step off the airplane or the train station, there are stands with Oktoberfest costumes and authentic German clothing at every corner in Munich. The price range starts at 99 euros (approx. $112). They even have the clothing in children size – very adorable. Don’t get me wrong, dirndl and lederhosen are great and look fantastic, but not everyone can afford to fully take part of the Bavarian tradition. But the Munich locals are great and wonderful, and don’t object and make tourists feel unwelcomed. So, you should know thatyou can wear jeans or pants or skirtsas your Oktoberfest outfit if you feel comfortable and warm. After all, the festival is in late September, and Germany at this point gets cold. All high-profile events usually cost you a fortune. This isn’t the case with Oktoberfest, especially if you plan your visit well. Yes, the rides could be cheaper and yes, the prices inside the tents are a bit higher than the regular ones around Munich, but considering the German standard of living, they aren’t unreasonably high – quite on the contrary. Plus, the stands outside the tents offer tasty food and beverages for cheaper prices. So, those on a budget won’t neither starve nor spend their last penny for a dish in the tents. For example, I noticed that even the souvenirs were affordable and almost the same price as the ones I bought in Nuremberg, Germany. You know how there are children fairs, late-night parties, and casual festivals that target a specific audience? Well, Oktoberfest is not such an event because it’s great for everyone. Oktoberfest has activities for everyone! The festival opens in the morning and closes late at night; it hasfair rides for the youngestvisitors as well ascool stuff for party-animals and thrill-seekers. Those with kids can go in the morning and have fun without being forced to avoid drunk people and extreme crowds. Those that want to party can go in the tents and drink without having to worry about making noise or being inappropriate (usually after 8 PM the tents are full of drunk people that dance, sing, spill beer etc.). And, most importantly of all, Oktoberfest is wheelchair accessible. Even the tents and bathrooms have ramps. It would be a sin not to mention the food and the drinks when listing all the positive aspects of Oktoberfest. Visitors can enjoy various kinds of the best Munich and German beer or spice up their night with some delicious (and strong) schnapps. The food options are numerous, with various kinds of wursts, chicken platters, pork chops, sandwiches, and even pancakes. Of course, how can one go to Oktoberfest and not try an authentic German wurst. You would expect for an event of this scale to produce dirty streets and lots of garbage. Well, that may be the case everywhere else, but not in Germany. I was pleasantly surprised to find out that even during Oktoberfest, Germans are very conscious about the environment and they have come up with cool ways of helping preserve it and avoid pollution. For example, when buying plastic bottles from the food stands, you pay 1 or 2 euros extra and receive a voucher. When you return the bottle with the voucher you are given back the money. So, many visitors (at least the ones that aren’t drunk) are motivated to return the bottle instead of just throwing it on the streets. 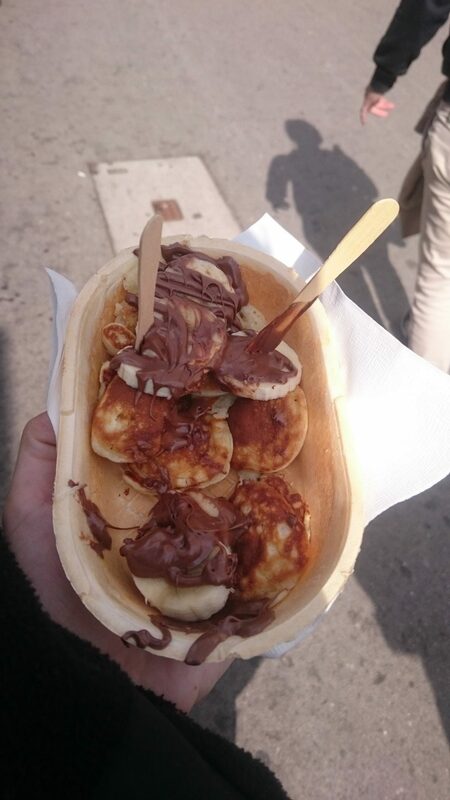 Also, instead of plates, you may expect interesting edible options like the cone-plates they provide when getting pancakes. Unfortunately, we live in a time when crowded places and popular events often seem like a scary choice. Like it or not, many tourists worldwide wonder whether it’s smart or safe to visit a festival like Oktoberfest and they have every right to do so. However, German authorities take Oktoberfest and safety very seriously. As mentioned before, every entry point has security guards. Visitors wearing backpacks or large bags must show the contents in those bags. Secondly, there are groups of police officers present on the grounds and outside the festival, so even if something bad happens you can easily find help. Finally, before entering any of the tents everyone police officers preform a check on all those entering and their belongings. If any of these positives didn’t seem quite attractive to you, wellyou shouldn’t forget that Oktoberfest is in Munich. Believe me, this is a gorgeous city with amazing architecture, awesome places to visit and see as well as excellent public transportation. There are many guided tours in Munich. The official Oktoberfest organizers even have a guided tour of Munich for only 15 euros. So, if you’re bored at the Oktoberfest or just got enough of it, you can always leave and go explore the beautiful City of Munich – that’s what we did. You don’t even need a guided tour. If you got a city map of Munich and a public transportation card, then you are set to see Munich on your own. I absolutely recommend getting a public transportation card when in Germany. It not only covers busses, but it covers the light rails, trains, and subways. The prices are very affordable especially if you get a group ticket that lasts all day that you can use with any form of transportation. Just make sure you all stick together incase there is a ticket check. The Bavaria Statue at Oktoberfest in the Theresienwiese Fields. Well, we’ve established by now thatOktoberfest is EPIC!If you didn’t read the section “Why Visit Oktoberfest?,” do so now before reading if it’s worth it. It is the largest beer festival in the world and if you have a chance to visit it, I highly recommend you doing so. I’ve created this Oktoberfest for Tourists Guide to help future visitors to set their expectations straight and plan their trip accordingly. But no travel guide is complete without talking about the negative aspects to decide if it’s worth visiting. So, for anyone out there planning to go to Munich be sure to read about the dreadful side of Oktoberfest to get the whole picture. Even though I previously mentioned to fully experience the festival you need to immerse yourself in the crowd, it can also be a dreadful thing. If you are a person like me, then you probably don’t feel comfortable being stuck in a crowd, waiting forever in lines to buy food or being unable to walk on a street without people constantly pushing you. Yes, everyone’s smiling, everyone’s happy and visitors are generally in a good mood; however, that doesn’t exclude the fact that there are people literally everywhere. Plus, even if you try to escape the festival and go explore Munich instead, you will find that all means of public transportation and streets that lead towards Oktoberfest and the Theresienwiese fields are crowded as well. Remember how Adidas launched beer and puke resistant shoes for Oktoberfest? Well, that should reveal enough on the topic of ruined clothes and shoes. Visiting the festival during the day when everyone is still in a normal (semi-sober) condition may save your clothes from destructions. But getting stuck in a crowded tent with hundreds of drunk people is the secret formula to having your clothes and shoes stained with various drinks, food, sauces etc. I strongly advise to wear your oldest shoes and get mentally prepared to throw away whatever you’re wearing in case you plan to join the late night (drunk) party at Oktoberfest. Whatever you do, don’t wear your favorite clothing or something new that you just purchased and it’s expensive. Finding Space in Tents at Oktoberfest Munich. Many say that you haven’t experienced Oktoberfest unless you had at least one beer in the popular tents. These huge buildings that resemble storage units are equipped with hundreds of wooden benches and tables, offer live music and a bit of expensive food and drink menus. But due to the enormous number of visitors – sometimes over tens of thousands of people in only a few hours – it’s oftennext to impossible to find a spot thereif you arrive after noon. During the weekends the tents are full even before noon. It is an option to book a table online;however, if you are a couple or fewer than 8-10 people…good luck with that. I was shocked by how easy it was to spend money at the festival. There are numerous different park rides, all kinds of souvenirs and food stands. For example, I paid 6 euros for a Scary House ride, 5 euros for a gingerbread heart, 10 euros for a hat, 10 euros for a pork chop and water, 10 euros for a 1-little beer, plus an additional 5 euros for pancakes. Total of 46 euros in 2-hours. All of this was outside the tents, except for the beer. The halls are even more expensive. So,I highly recommend creating a daily budget, carefully planning your cash and somehow preventing yourself from buying literally everything that catches your eye. I’m not going to lie, Oktoberfest surprised me when I first got there. To me,it seemed like a state fair or carnival on steroids, as I have already mentioned in the previous parts of this guide. Did I like Oktoberfest? Yes. Did I have fun at Oktoberfest? Yes. Do I regret visiting Oktoberfest? Absolutely not. However, I’ve heard manypeople complaining that they expected much more than fair rides and food standsand I can understand their point of view. So, I think it really depends on the person and their preferences whether Oktoberfest is a one-of-a-kind experience or just a larger-than-usual fair. Every year there seem to be some new rules added to the already-long-enough list of rules that visitors should have in mind. For example, this year theybanned backpacks and large bags. Also, there arerandom identity checks, lots of police officers and even a ban on outside drinks. Most importantly of all, you CAN NOT drink alcohol outside of the tents, or while standing in the tents.You CAN only drink when seated.